The November 11, 2011, 11 seconds and 11 minutes after 11 o'clock, three men will be aligned with all the planets of the solar system, deciding the fate of a country. Three men whose birth number sum will be the magic symbol: eleven. Three men, ladies and gentlemen, three men who can decide the fate of a country: Italy. I'm talking about Lloyd Blankfein (Chairman of Goldman Sachs, the bank that seems have caused the Italian spread, also linked to Monti…), Silvio Berlusconi and Mario Monti, his successor. 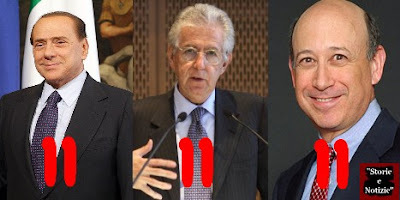 Lloyd Blankfein, born 20/09/54, Silvio Berlusconi, born 29/09/36 and Mario Monti, born 19/03/43.